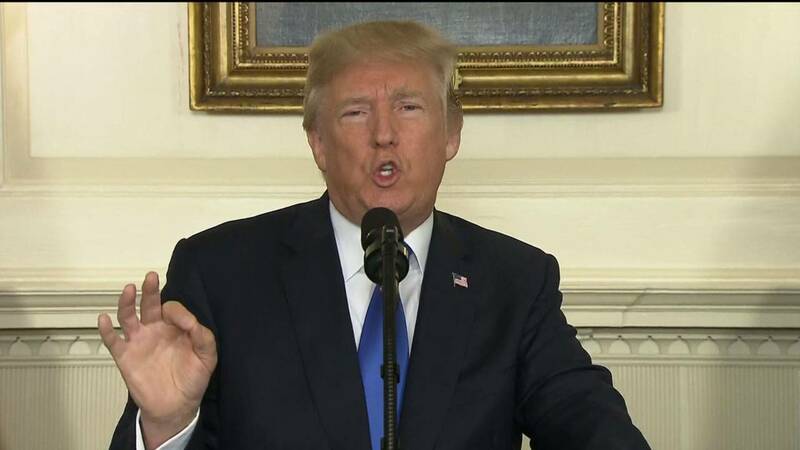 WASHINGTON (CNN) - President Donald Trump on Thursday complicated a closely coordinated effort between his administration and congressional Republican leadership on a six-year extension of Section 702 of the Foreign Intelligence Surveillance Act, otherwise known as FISA. "'House votes on controversial FISA ACT today.' This is the act that may have been used, with the help of the discredited and phony Dossier, to so badly surveil and abuse the Trump Campaign by the previous administration and others?" Trump tweeted. The White House did not immediately respond to CNN's request for clarification on whether the President supports the bill, on which it has been working closely with congressional Republican leadership to secure the votes for reauthorization. Trump attempted to clean up the confusion surrounding his tweet later Thursday morning, writing, "With that being said, I have personally directed the fix to the unmasking process since taking office and today's vote is about foreign surveillance of foreign bad guys on foreign land. We need it! Get smart!" Trump has been critical of "unmasking," a term used to describe revealing identities of Americans who were communicating with foreign officials under surveillance by the US intelligence community. On Tuesday, the White House issued a statement of support for the bill, saying that Section 702 "is vital to keeping the nation safe" and that reauthorizing the bill before its expiration "is a top priority of the administration." Section 702, which allows the intelligence community to monitor foreign communications, is set to expire January 19. Critics of the program argue that it allocws the warrantless collection of US citizens' private information. The dossier to which Trump referred is an opposition research document that was compiled on him during the election, and it includes unverified allegations that the Russian government has compromising personal and financial information about the President. CNN has reported that the FBI in 2016 used the dossier as part of the justification to win approval from the secret court that oversees FISA to secretly monitor a Trump associate. The secret court that oversees FISA also authorized the surveillance of former Trump campaign chairman Paul Manafort, but it is not clear that was active during his time on the campaign. The first FISA authorization predated the dossier as the investigation began back in 2014. There is no evidence they were poorly surveilled, as Trump claimed in his tweet. All the actions were approved by the court. Trump's initial message came shortly after Fox legal analyst Andrew Napolitano appeared on "Fox & Friends" and urged the President not to back FISA reauthorization. Trump appeared to quote the on-air banner used during the segment in his tweet. The reauthorization is potentially a politically fraught issue on Capitol Hill, and the House is expected to vote on the bill later Thursday. House Minority Leader Nancy Pelosi called House Speaker Paul Ryan and urged him to pull the bill in light of the President's tweet and send it back to committee, a senior Democratic source told CNN, though she announced shortly thereafter that she would support the bill. In a CNN interview on Wednesday, Sen. Rand Paul, a Kentucky Republican who frequently champions civil liberties issues, threatened to filibuster the reauthorization, citing privacy concerns. The President called Paul after he sent his first tweet, a senior Paul aide said. Paul is part of a bipartisan group in favor of the USA Rights amendment, which makes major changes to the program, including prohibiting the use of information collected incidentally on Americans without a warrant under the FISA 702 statute, except in case of emergency. The President told Paul that he supports the "USA Rights" amendment on Thursday, the aide said, but press secretary Sarah Sanders issued a statement Wednesday evening announcing strong opposition, saying it "would re-establish the walls between intelligence and law enforcement that our country knocked down following the attacks of 9/11 in order to increase information sharing and improve our national security." Former FBI Director James Comey weighed in on the issue, tweeting, "Thoughtful leaders on both sides of the aisle know FISA section 702 is a vital and carefully overseen tool to protect this country. This isn't about politics. Congress must reauthorize it."